The Leopard Survey team was out in the field checking cameras when we all spotted an animal in the distance. Tucked away in the tall grasses of Hluhluwe-iMfolozi Park, there walked a pair of Secretary birds. The binoculars and reference books were immediately recruited to learn more about this fascinating bird. Opinions vary as to the origins of the name “Secretary bird” (Sagittarius serpentarius). Its common name is thought to derive from the crest of feathers. These quill-like feathers give the appearance of a secretary with quill pens tucked behind his/her ears. However a fairly recent hypothesis has been proposed, a French take on the Arabic sagr-et-tair which translates to “hunter-bird”. This hypothesis directly aligns with the translation of the Latin name, Sagittarius meaning “archer”, perhaps a description of the quills, and serpentarius which highlights the bird’s skill as a hunter of reptiles. The Secretary bird is a bird of prey that is grey in colour with black accents on the wings, thighs and central tail feathers. 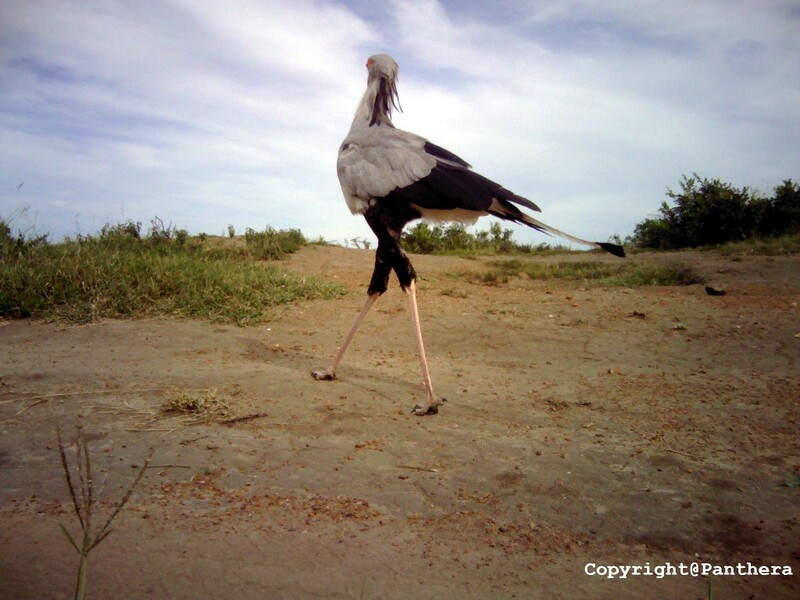 Morphologically the Secretary bird is set apart from other raptors as S. serpentarius have very long legs and longer feathers. 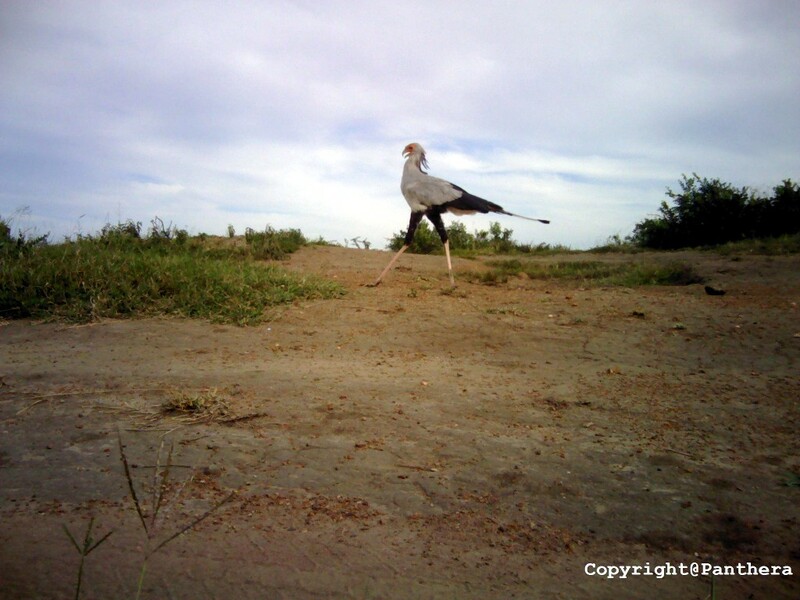 Secretary birds also differ behaviourally as they are mainly terrestrial, walking in search of prey items. They find most of their food on the ground. The diets of these birds consists largely of reptiles (with snakes featuring as a favourite) while amphibians, rats and other small mammals are also consumed. Once a snake has been spotted, the bird will grasp it with its toes and beat it against the ground, then throw it into the air several times to stun it before enjoying a well-deserved meal. 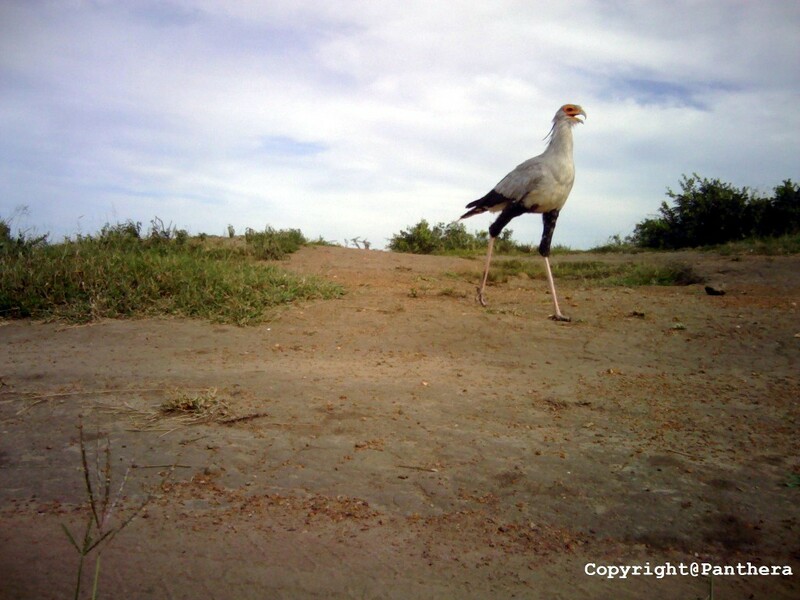 Secretary birds are listed as Vulnerable on the IUCN Red List with loss of habitat and deforestation being the biggest causes of population decline. Other drivers of population decline include loss of grassland due to bush encroachment driven by rising CO2 levels and increased telephone and power line collisions. The Leopard Survey team have enjoyed the privilege of being able to see these birds out in the field and then again back at camp while looking through camera trap images. If you would like to do more to aid in the conservation of Southern African bird species take a look at Wildlife ACT’s efforts in Vulture protection and conservation.